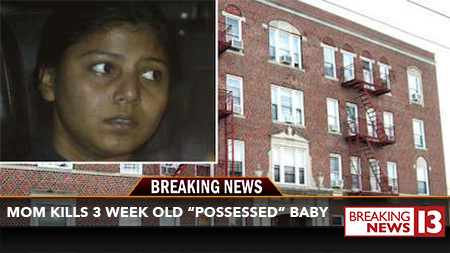 Mother Kills 3 Week Old Baby By Throwing Him Out The Window Because He Was "Possessed"
New York – A New York woman who allegedly killed her infant by hurling him out of a fourth floor window told police the child was possessed. 21-year-old Rashida Chowdhury from Queens, New York, is charged with the murder of her son, three-week-old Rizwan Ahmad, after authorities claim she threw him out of her Richmond Hill apartment window to rid him of an evil spirit. According to court documents, Chowdhury originally told police that she had awoken to her child having gone missing. However, she changed her story, confessing to detectives that the child had been sick. She believed he had been possessed and wanted to “stop the pain.” She was right about the sick part. After recovering from a viral infection, Ahmad had just been released from the hospital a day prior to his death. Ahmad, who had a medical examiner determine he died from “blunt impact of head and torso with skull fractures and lacerations of the liver, brain and spleen”, was found wearing a blue and white onesie in a pool of blood below Chowdhury’s apartment. A neighbor claimed they heard an “unusual” sound of 4 AM and upon inspection found the infant. This held without bail and on suicide watch, Chowdhury is charged with intentional murder and murder of a victim under the age of 11. If convicted, she faces life in prison. She reportedly has two other children, ages 2 and 8.